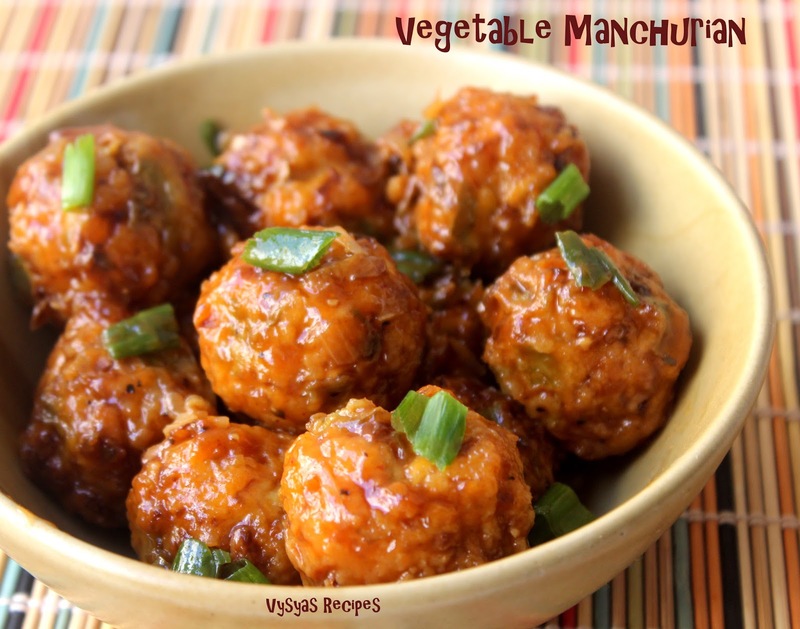 Vegetable Manchurian is a Popular scrumptious Indo - Chinese appetizer & it can also be Served with Vegetable fried Rice or Noodles. Vegetable Manchurian is made with vegetables like Carrot,beans, cauliflower & capsicum mixed with flour, deep fried till Golden, then simmered in Spicy tangy Sweet Sauce. I have not added Ajinomoto & vinegar.but still the result was similarly delicious like Restaurant style Veg Manchurian.Now we will see the preparation of Veg Manchurian. Maida/All Purpose flour - 4 tbsp. Chilli Sauce - 1 tsp. Spring Onion(white) - 1/4 Cup. Soya Sauce - 2 tsp. Chilli Sauce - 2 tsp. Corn starch - 2 tsp. Grate the Carrot, finely Chop Cabbage,Cauliflower,Capsicum,Ginger,Garlic, Spring Onions White & Green Part. chop the Green Chillies. Mix Soya Sauce,Chilli Sauce, Ketchup & Pepper Powder,keep it ready. Dissolve Corn flour in 1/4 cup of water. Take a Mixing Bowl add grated Carrot,finely Chopped Cabbage,Cauliflower,Capsicum,Ginger,Garlic Corn flour,Maida,Chilli Sauce & salt. Mix well to form the dough.Veggies oozes water, not necessary to add single drop of water. Shape the Mixture into small Tiny balls. Heat the oil, when oil is hot, drop small piece of dough, if it pops up immediately, it is an indication that oil is hot.Now drop 3 to 4 balls. Cook in Medium flame. fry till the balls turns Golden. Drain on kitchen tissues. Cook in Batches. Heat the kadai or wok, add finely chopped Ginger,Garlic, Green Chillies.Saute till it turns lightly Golden & aromatic. Add Green Onions(white Part) saute till it turns pink. Add the sauces that we mixed already, saute for 1 - 2 minutes. Add cup of water, when it starts boiling add Corn flour dissolved in 1/4 cup of water. Cook till sauces thickens,then add fried balls,Mix well. Garnish with chopped Spring onions Green Part. Serve hot as appetizer or side dish for Noodles or fried Rice. Always clean the cauliflower & use it. While Making balls, it is not necessary to add even the drop of water. veggies will oozes the water. Always cook the balls in Medium low heat, if cooked in high flame, outside will be cooked, leaving inner side uncooked. while deep frying, if the balls break add some more quantity of maida to the dough. I have prepared Manchurian dry, if you want it as Gravy add one more cup of water & reduce the quantity of corn flour for sauce. you can also fry the vegetable balls in Paniyaram pan, if so parboil the veggies for 8 - 10 minutes, then add the flour to hold balls. I have added Ketchup for light sweet & tangy taste. I have not added ajinomoto for health Issues.